As we’ve hinted, we’ve made some big changes to covers on LibraryThing recently. There are more covers to choose from than ever, and we’re excited to show you what’s new! No, really, all of them. 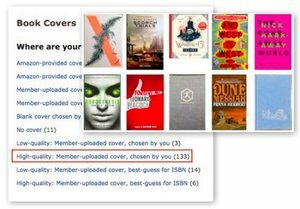 LibraryThing now shows all Amazon covers for your books and other media—this includes covers for books with ASINs (and no ISBNs). 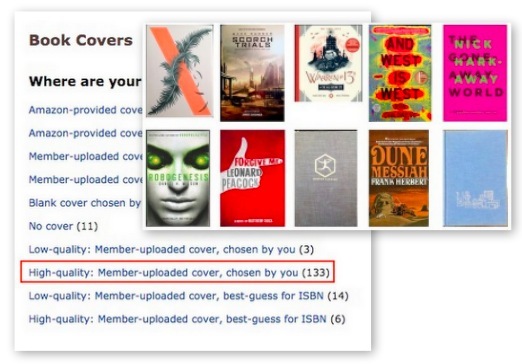 So many of your ebooks, CDs and DVDs now have Amazon covers available to use. You can also see stats on your cover usage—where your covers come from, and how many of them you’re using from various sources. To see where your covers are coming from, check out the Book Covers section of Stats/Memes. Changing the cover for one of your books to a different Amazon cover no longer forces you to change the ISBN of your book. You’ll still have the option to switch ISBNs if you like, but it’s no longer required. When switching to a new Amazon cover that’s associated with a different ISBN, you’ll see the dialog box pictured at right, with a check box to indicate whether you’d like to change your ISBN, too. To try it out, select a cover image, click the “Information” magnifying glass, and then click the “Flag this cover” link in the detail box that pops up. UPDATE: I FORGOT TO ADD! Lastly, works without covers are now showing the title on the fake cover. See example, example, example. Or see the image to the right. The trick is, the words aren’t superimposed on the covers. We’re actually making images that include the words on the covers. This is a neat trick, allowing us to produce “fake” covers at any size we want, wherever we want–on any page, inside or outside of LibraryThing. So far this technology is only on work pages. It’ll be spreading elsewhere soon. Any questions or trouble with new covers? Come join the discussion on Talk. Vote “yes” totals at least 4. Vote “yes” totals at least 3x vote “no”. Love that I will no longer have to change ISBNs to change covers. I always enter accurate ISBNs but my books often have different covers because they come from UK publishers not US ones. Before now I was forced to scan the cover in order to be able to keep my ISBN. Would it be possible to have more variety of plain colours to choose from for the generic covers? Just plain colours without any silver borders or other fancy stuff. Would you also make generic ‘cover’ for Kindle versions? I mostly read on this device, and have been using my own image. Generic covers should work for anything you’ve cataloged on LibraryThing that doesn’t have a cover image. However, it sounds to me like you’re wondering about having those covers show up on your Kindle as you’re reading. Unfortunately, that’s something we can’t do. Generic covers are only for display on LibraryThing. We don’t mind if you want to copy the generic cover from a work and use it as a cover for your book on your Kindle, but this is not a feature we’ll be developing. Sooo fabulous that the plain covers will have the titles and authors! Love that the ISBNs won’t change, and Hurray! for getting the Amazon cover files….now my audio books will be listed properly. Oh dear, will I feel compelled to update my catalog? Yes, but how fun to revisit my collection! Happy Anniversary, you old LibraryThing you! love all these changes!!! Great work, LibraryThing team! This will be very useful! Thank you!